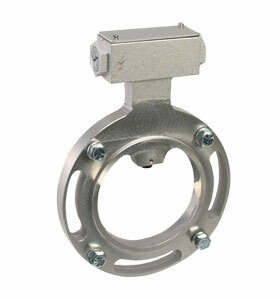 The OMDC-CF series sensor mounts directly to a motor’s, NEMA C face. It operates at a 4.5 to 24 Vdc level producing a square wave output which may be used with closed loop controls, or other digital devices. The OMDC-CF Series motor pick-up sensor kit can be used in place of the OMDC-PU-E series to monitor motor speeds when access to the motor shaft is otherwise impossible. Note: Kit comes complete with motor race ring, sensor, mounting bolts, sensing disk and operator's manual. * Frame sizes 143TC, 145TC, 182C and 184C with 7/8" dia. shaft.